Looking for a reputable builder in Northamptonshire? Looking for a contractor you can trust? Looking for an expert with over 20 years experience in block paving paths, driveways and patios? 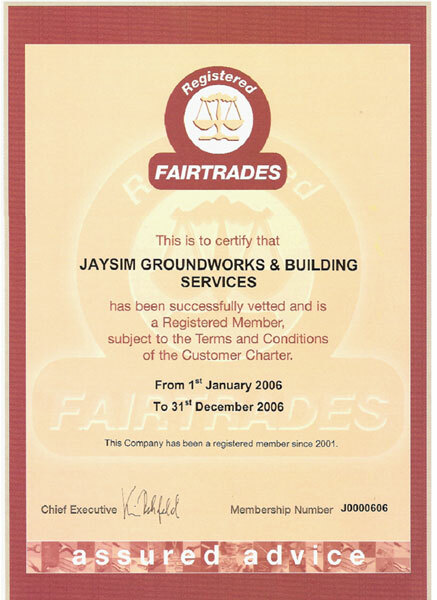 If so then call Jaysim Groundwork & Building Services for all your construction needs. We can extend your home and add value to your property with a professional house extension. Block paving is one of our specialities and we can transform your garden with new patios, paths and driveways. Situated in Higham Ferrers, Northamptonshire and willing to travel and meet all individual needs. Free quotations are available with full attention to assist you in selecting the right works for your property. We can take care of any fencing or drainage jobs that you need completed. Interior and exterior tiling can be easily undertaken. We are a Northamptonshire based family run business with over 20 years experience. We pride ourselves on our reputation as professional and reliable builders. So remember when it comes to block paving patios paths and driveways nobody does it better than Jaysim builders. Unlike many others we are fully insured and registered members of Fair Trades, ensuring quality of work and piece of mind. Click here to see our registration. We also receive many letters of reccomendation from satisfied customers which, along with any other official documentation can be viewed at your request.